Ethan Miller / Getty ImagesThe technology sector is risky. GameStop shares are crashing after the company reported disappointing earnings. Executives said that a delay in a new version of the video game “Assassin’s Creed” negatively impacted sales. But the falling share price reflects that analysts and experts are worried about some long-term issues with GameStop’s business. Sterne Agee analyst Arvind Bhatia detailed some of those concerns in a note to clients. 1. Customers aren’t buying old versions of video games. One of the main reasons GameStop’s business is declining is because customers aren’t purchasing games for the Xbox 360 and PS3, instead opting for the Xbox One and PS4. GameStop needs to figure out a way to move out the old inventory while still turning a profit. Company president Tony Bartel assured analysts that this is a temporary issue because newer versions of video games are performing so well. 2. Digital downloads are still risky. GameStop boasted that its digital business grew by 52%. Digital downloads now make up 10% of total sales. Bhatia notes that it’s unclear whether the trend of downloading a game rather than buying it will continue, or whether GameStop will expand its offerings. Analysts also expressed concerns of whether digital downloads would yield the same profits as phyiscal products in the long-term. 3. Wal-Mart’s used game business could be a big competitor. 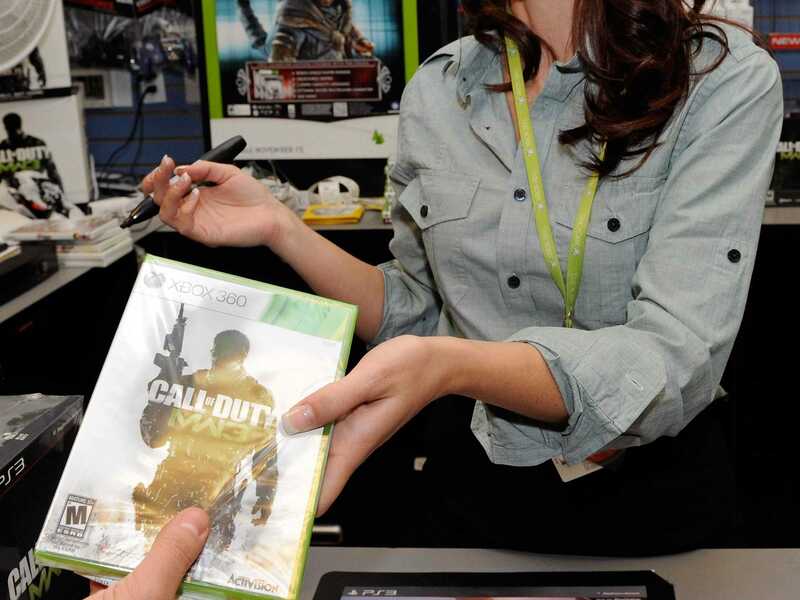 Earlier this year, Wal-Mart launched a trade-in program for used video games, which analysts surmised could be a huge threat to GameStop because of the retailer’s ubiquity and convenience. GameStop, which has offered the service for years, denies that Wal-Mart is a threat. “We continue to monitor our stores and have not seen an impact on pre-owned trades or sales due to other retail competition,” CFO Robert Lloyd told analysts. 4. The technology sector is notoriously volatile. The digital entertainment sector is constantly evolving, and GameStop has experienced instability in the past. GameStop closed 200 stores in 2012 as customers turned to tablets and smartphones over video games. As a video game retailer, GameStop must always rely on having the most exciting technology from partners like Microsoft.